Annual Reports are shifting from result-driven documents to ones that tell you ‘how’ a business produces those results. Although increased or decreased share prices are at the organization’s bottom line; people are becoming just as conscious of how a company does business, viewing businesses that make ‘profit alone’ as poor business. The new consumer is becoming conscious of how systems work, is well- connected and forms opinions quick and influencing his choices. With this the need for annual reports to shift from being finance-focused documents to organization-focused, sharing a sense of purpose and inspiration across stakeholders is becoming essential. There is so much to be said about a business- a system of interconnected and interdependent activities that determines the way the company ‘does business’, with its customers, partners, vendors, etc. An activity system conducted to satisfy the perceived needs of the market, community and other parties, their activities and how they are all linked to each other. Successful reports will be those that showcase an organization’s strategy towards profitable growth through its business model, culture, transactions, etc. emphasizing its commitment towards vision, values and quality. As Drucker points out, What the customer buys into and considers value is more than just the product, it is the overall satisfaction of the product. However, as Thaler & Sunstein would put it, this insight that ‘everything matters’ can be both paralyzing and empowering. The key would then be in the very choice and design of the message, empowering stakeholders to connect with key messages and aspirations. We are seeing a shift in the message, audience and the medium too. Delivering through internet based platforms allows a global distribution of information. The media landscape is evolving and with it new strategies and forms of communication. The Radio took 38 years to reach 50 million people, television took 13 years, the internet took 4 years. The internet has also changed the way businesses are being managed. With the opportunities of globalization have also come its threats; with businesses moving towards more interdependence has come the need to adapt organizational structures and strategies. Organisations adapting have been found to have improved performance. The internet is changing not only our reach, but the scale of our businesses too. Businesses are now operating within fixed structures yet thrive on collective intelligence that is rooted in the shift from a hierarchial world of management to a flat and flexible organizational model. It sustains on information processing that builds patterns and thrives in an open-ended system. We need to make our businesses communications a little more social; engagement builds in sustainability and inspires new emerging futures. Communication collaterals whether annual reports, brochures, websites, aim to empower businesses on the road to growth and prosperity by engaging with stakeholders. Our environments and interactions are evolving drastically, and so are our message and our tools. 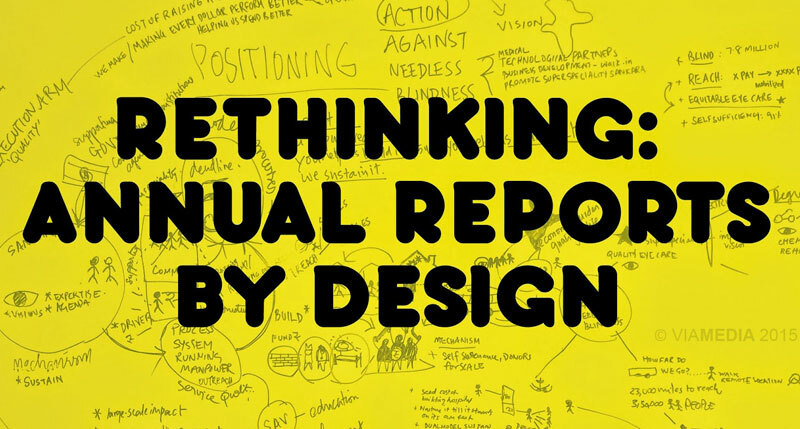 It is important to understand the purpose of your annual report. For organizations like NGOs, annual reports pose at the forefront of marketing and funding. The potential for Annual reports as a marketing tool more often than not have been neglected and its potential unrealized. An unhibited tone of communication, helps customers trust organizations better and engage quicker. Trust is after all a marketer’s most precious asset. Annual reports are evolving at the heart of corporate and marketing communication. The ultimate objective of marketing is to reach customers in an integrated fashion with the right messages at the right time in the most effective and productive way. The bottom line is pride and association or participation with the company. As Charles Thiede says “Information is easy now, clarity and insight are not.” To move from tables and columns, bars and graphs that are painstakingly laid out and unfortunately more painstaking to consume, to analysis insight, told through a good story, making data less data-like.